Enhanced optical force. 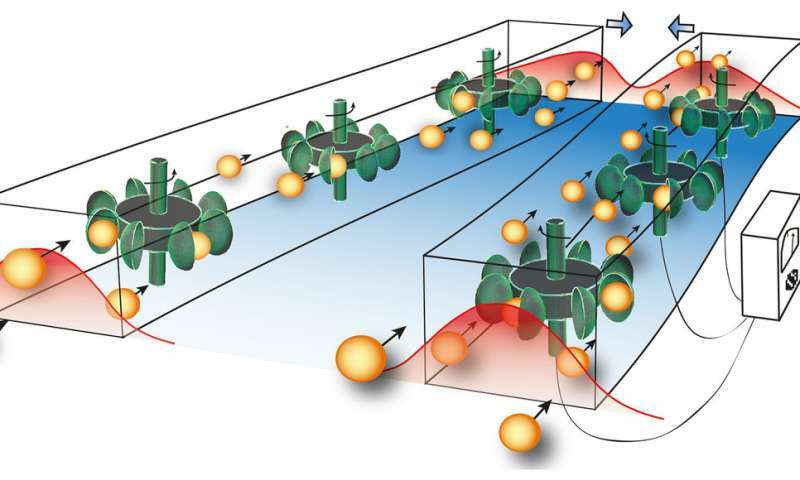 When light flows into the waveguide made of metamaterial, the photons (yellow) are tricked to move to one side. Here the action is visualised by the rotors (green). When all photons are assembled on the same side, the optical force (blue) between the waveguides is strongly enhanced. The curves (red) show how the light has moved from the middle to the side of the waveguides. Credit: Sophie Viaene, Lana Descheemaeker and Vincent Ginis. Light consists of a flow of photons. If two waveguides – cables for light – are side by side, they attract or repel each other. The interaction is due to the optical force, but the effect is usually extremely small. Physicists at Chalmers University of Technology and Free University of Brussels have now found a method to significantly enhance optical force. The method opens new possibilities within sensor technology and nanoscience. The results were recently published in Physical Review Letters. To make light behave in a completely new way, the scientists have studied waveguides made of an artificial material to trick the photons. The specially designed material makes all the photons move to one side of the waveguide. When the photons in a nearby waveguide do the same, a collection of photons suddenly gather very closely. This enhances the force between the waveguides up to 10 times. "We have found a way to trick the photons so that they cluster together at the inner sides of the waveguides. Photons normally don't prefer left or right, but our metamaterial creates exactly that effect," says Philippe Tassin, Associate Professor at the Department of Physics at Chalmers University of Technology. Philippe Tassin and Sophie Viaene at Chalmers and Lana Descheemaeker and Vincent Ginis at Free University of Brussels have developed a method to use the optical force in a completely new way. It can, for example, be used in sensors or to drive nanomotors. In the future, such motors might be used to sort cells or separate particles in medical technology. "Our method opens up new opportunities for the use of waveguides in a range of technical applications. It is really exciting that man-made materials can change the basic characteristics of light propagation so dramatically," says Vincent Ginis, assistant professor at the Department of Physics at Free University of Brussels. Could this also be used to help in chip manufacturing? I know we are near the limits of the current frequencies being used, but if this method is able to further refine the path of photons, it could lead to further advances. Just what is this "optical force"? I got a better question for you. Just what is "google"? Maybe you should find the answer to that one first. Here's another one - just why do people come here and ask amateurs to explain things to them when they can get real explanations from competent experts on the net? That's an even bigger mystery you need to solve.